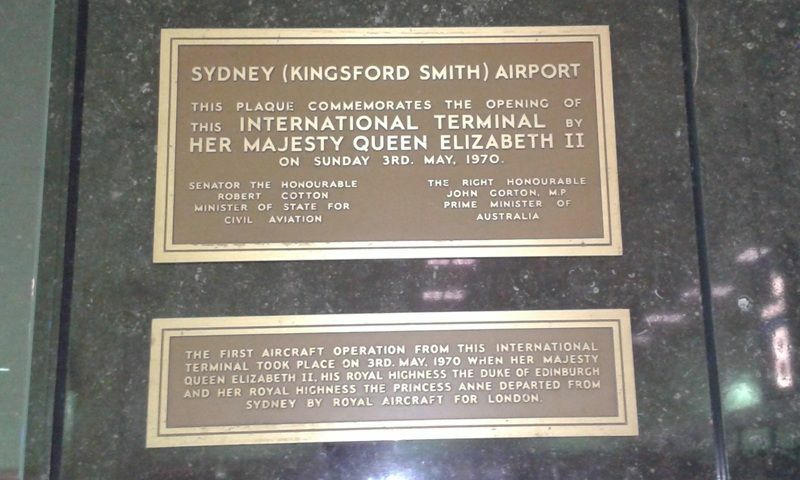 A plaque commemorates the opening of the Sydney (Kingsford Smith) Airport International Terminal by Queen Elizabeth 11 in 1970. By the 1960s the need for a new international terminal at the airport had become apparent, and work commenced in late 1966. Much of the new terminal was designed by Paynter and Dixon Industries. The plans for the design are held by the State Library of New South Wales. The new terminal was officially opened on 3 May 1970, by Queen Elizabeth II. ROBERT COTTON JOHN GORTON, M.P. THE FIRST AIRCRAFT OPERATION FROM THIS INTERNATIONAL TERMINAL TOOK PLACE ON 3RD. MAY, 1970 WHEN HER MAJESTY QUEEN ELIZABETH II, HIS ROYAL HIGHNESS THE DUKE OF EDINBURGH AND HER ROYAL HIGHNESS THE PRINCESS ANNE DEPARTED FROM SYDNEY BY ROYAL AIRCRAFT FOR LONDON.